Arcadia Truck Accident Injury Lawyers - Your Trusted Partner in Personal Injury and Wrongful Death Claims Prestigious Truck Accident Injury Lawyers In Arcadia, Los Angeles, California! No one wants to be injured in a truck accident in Arcadia. But should you be injured, or a family member killed with a wrongful death claim, our Arcadia truck accident lawyers and personal injury & wrongful death law firm provide expert injury legal services for those injured in any truck accident, car accident, motorcycle accident or other injury accident in Los Angeles, Arcadia and all of California. We offer dynamic and compassionate legal representation not only for those injured in truck accidents, but also to family members of victims, involved in an 18-wheeler and big rig vehicle crash, for wrongful death claims in Arcadia, Los Angeles, California. So, if you or a loved one has met with a truck accident or need assistance in other accident and personal injury claims in Arcadia or anywhere else in California, please contact our personal injury attorneys and law firm now for a completely FREE CONSULTATION. 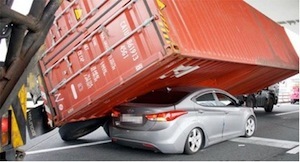 In addition, you can find helpful information on truck accident cases and wrongful death claims. You also can get more information about our Arcadia & Los Angeles truck accident personal injury & wrongful death lawyers and legal team by visiting our home page, our lawyer profiles, our personal injury & wrongful death cases verdicts & settlements, and relevant testimonial pages. About Arcadia, Los Angeles, Calif.
Arcadia, a city in Los Angeles County, is located approximately 13 miles northeast of downtown Los Angeles. It is bordered by six (6) cities and communities, which include San Marino, Sierra Madre, Pasadena, Temple City, Monrovia and El Monte. As per the 2010 United States Census, Arcadia is home to more than 56,364 people. An Arcadia truck accident may cause extremely painful injuries with distressing results, including significant financial damage and physical and emotional trauma to the victims. Our skillful attorneys are aggressive in representing your rights and compassionate when it comes to walking you through the process of your truck accident claim and any other personal injury case. Tremendous experience in resolving personal injuries inflicted and wrongful death cases throughout Arcadia, Los Angeles, the San Fernando Valley, Ventura, San Bernardino, and all of California. We provide immediate assistance with medical attention, property damage repair and settlement, loan cars, monetary advances, medications, prescriptions, etc. Contact Us Now For Your Free Consultation & Case Evaluation for Your Truck Accident or Other Personal Injury Accident Claim! Please get in touch with our Arcadia truck accident injury lawyers and our legal team now for a completely FREE CONSULTATION and case evaluation. You can also speak with an experienced truck accident injury lawyer or any member of our legal team at 818-222-3400 (after hours, please press 1) or by calling us on our Toll-Free number - 866 INJURY 2 or 866-465-8792 (after hours, again please press 1). You may also contact us by emailing us at info@WalchLaw.com! Our consultation is absolutely FREE and we work on a contingency fee basis. There’s NO fee until you WIN! Call us now – You will be glad that you did!